So, the anticipation, the expectation, the preparation, the worry, the rumours; hearing that this School has been placed into special measures and that School has gone from Outstanding to requires Improvement, reading blog posts and getting more and more prepared for the inevitable. In reality what was it really like? Was it really that bad? What did the inspectors look for? What top tips can you give us?…… all questions I had previously asked Colleagues who have been through the somewhat dreaded ‘New Framework’ Inspection. Fortunately, from our recent inspection I can say it’s not at all that bad! As a senior leader within dynamic team at our College, two years ago we were faced with a School in Special measures and now, two years on we have been judged as Good by Ofsted in all categories of the inspection framework. As director of Teaching and Learning I knew it would potentially come down to the vast amount of lessons observed and more importantly the progress students were making within these snapshots. (Inspectors really motored through; 54 lessons were observed over 9 possible timetable slots across the two days). I use the term ‘the shackles are off’, I work hard with our teachers to encourage risk taking, the sharing of practice, realising failure is a necessary evil to evolve and most importantly love to undertake in an open dialogue about pedagogy. The notion that we must all plan lessons the same, using the same pro forma, deliver the perfect ‘three part lesson’ and of course the ‘fear’ of the dreaded observation will only move teaching so far before it hits a ceiling. After all, we strive to encourage students to develop as individuals so why not teachers? This YouTube clip ‘The flea experiment’ provides a great analogy to this. Tracking and monitoring: Develop an effective database to record all observations undertaken; explicitly documenting not only the overall judgement but also areas of strength/expertise and areas for further development. Information is power: Use this information to celebrate success and inform CPD, we have a staff ‘menu of expertise’ whereby teachers are categorised according to their identified areas of expertise. This is where the sharing culture really kicks in; based upon your areas of development you can informally observe this in action during an agreed observation, all working towards teachers developing each other. Communication is key; alongside weekly teaching and learning briefings, there are online ‘drops’ for teachers to share resources, an internal website for sharing top links, videos and other learning related material. The only way I can describe it; huge pressure! As Director of Teaching and Learning I had to deliver, how could I possibly hold credibility in my own head if I was anything less than Outstanding in the classroom? After all, I have to practice what I preach. So this is what happened………. ………………. I took a risk, I let students lead their learning but most importantly I did what I always do, nothing different, nothing unusual that could confuse the students. So, it was an ICT lesson with 30 mixed ability Year 7 students, the topic: Algorithms. 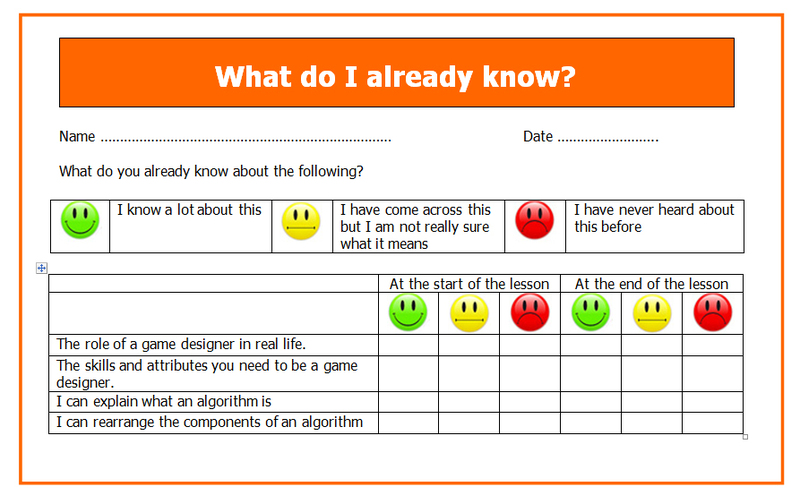 The lesson starter; ‘confidence across the learning objectives’ a clear and concise way to not only demonstrate progress within this lesson but also to target students for additional support where needed, this also serves as a great progress checker. The main thrust of learning was for students to investigate the correct sequence within the algorithm to achieve a functional outcome (using scratch) In envelopes students had the information, all they had to do, working cooperatively in pairs was to organise into the correct sequence, or at least what they thought was the correct sequence. Now, at this point, I decided to swap places with my star student, he became the teacher, I became the student. He used the interactive whiteboard to arrange the correct sequence based upon the feedback from the various pairs. I should point out that at this point the inspector arrived in the room and there I am sat down not doing anything!! Eventually the contributions ground to a halt, then I released the star student to question the group until eventually a general consensus was agreed. After this 15 minutes (longer than I had planned) I swapped back to ‘teacher’ A quick mini plenary revisiting the confidence grid, confirmed all students had made progress and it was time to move on and put this into practice, the inspector had seen enough and left. ……………… the feedback was an Outstanding lesson, because all students were making rapid and sustained progress, how did we know? Because they were able to demonstrate progress from the start of the lesson. To support progress within the lesson use annotated seating plans that show how well the teacher knows their class are vital. Aim for this data for every student in every class that is then handed to the inspector as they walk into the room. Is this student a member of a vulnerable group? Progress in lessons has to be the priority, this will ultimately be the judgment which dictates the overall judgement of teaching and Learning across the School. More interestingly, this can also impact on the judgement on attainment and as we know this drives the overall judgement. When students go into groups or pairs-carry on teaching-don’t become the facilitator whatever that is! You must know who the vulnerable students are and where they are sitting and use your seating plan and lesson plan to show you have a plan for every one of them. How are you deploying your TA? They have to be aware of what is happening in the lesson-if a student is being taken out for intervention, the person leading the intervention has to be delivering at least good or outstanding support. 4. What did students get from the lesson today? How did we meet the objectives of today’s lesson? What was the link between last lesson and today? What do you think we are going to do next lesson? How could you make use of the skills and knowledge from today in your everyday life? How would the lesson today support a career that you or a friend might be interested in? Don’t get obsessed with trying to ‘shoe horn’ in too many quirky activities and run the risk of restricting progress with too many fragmented aspects to learning. 6. Stick to your word. If you say you are going to give students a set time period to learn independently, for example a discussion, then give them the time. Do not interject and disrupt their learning. This was a key factor in restricting some outstanding judgements when I undertook paired observations with inspectors – interesting. Remember it’s okay to Deviate from the plan! I sincerely hope this was helpful, even if only in a small way!